A BusinessOptix library is a central repository for your Business Architecture, holding business models, master data and configuration for your organisation. This document provides recommended guidelines for the governance of a BusinessOptix library. Individual organisations are expected and encouraged to tailor these guidelines to suit their own specific requirements and preferred working practices. The next section of the document discusses this workshop. The purpose of the introductory workshop is to review, revise as necessary, and agree the Governance Recommendations provided in this document. 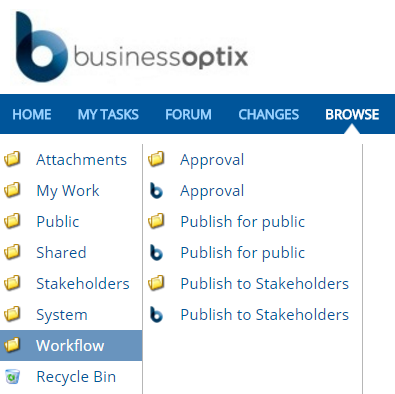 In the process, workshop participants will gain familiarity with the BusinessOptix library. Who do I need to invite to the workshop? Sections will typically correlate to projects or departments. There should also be a specific Section Owner for Master Data, responsible for the completeness and consistency of the master data lists. Responsible to the relevant Section Owner for creating and editing models within their section. Authors should be assigned to groups, corresponding to the sections they work in. An Author may be assigned to multiple groups. In particular, there should be a Master Data Authors group, responsible to the Library Owner for maintaining the library’s Master Data lists (except for very large libraries, these will usually also be members of other groups). Responsible to the organization for the real process (or other entity) whose model is maintained in the library. In the case of Master Data, the Process Owner should be the Library Owner. The Process Owner’s role in modeling is often restricted to final approval. Responsible to the Library Owner for providing guidance and assistance to Authors, to ensure the consistent application of modeling guidelines across all areas. Should be experienced in process development and applicability for business process improvement. Responsible to stakeholders for reviewing new and modified models, and providing feedback to the Section Owner and Author. Responsible to the organization for signing off new and modified models, prior to formal publication. Approvers should include at least the Process Owner. At the topmost level, the standard BusinessOptix library has a fixed structure, comprising a standard set of configuration and content folders. These folders hold the configuration information which determines what the library can contain, and how it can present that content. With the exception of the Reports folder, which any user can browse and open reports from, only the Library Administrator can access these folders directly. Stencils (which determine what types of model are available and what content is allowed in each type). Styles (which define the different types of HTML, PDF and Office document output provided by the library). Workflow Active workflow definitions and in-flight instances of those workflows. Files deleted from the library. The Library Administrator can copy files back out of here. The TAILORING section of this document describes the ways in which these folders can be used to tailor the library to the organisation’s specific needs. 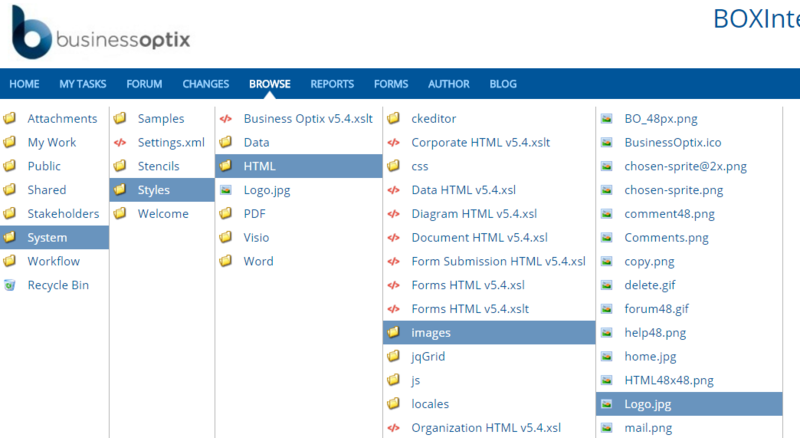 These folders hold models, along with outputs (such as HTML pages and PDF documents) generated from those models. ‘Scratch’ working area for each individual Author, used for experimentation, partial models, and other content that is either not intended or not ready for collaborative use. Authors are free to create any internal structure they wish within their My Work areas. Collaborative area for model development. Unlike the other areas, keeps earlier version of every model. Individual versions may be checked out to guard against concurrent updates by multiple Authors. The definition and management of folders within the Shared area is discussed under SHARED FOLDER STRUCTURE below. The internal structure of the Stakeholders area always mirrors that of the Shared area. The structure of the Shared (and, by extension, Stakeholders) folder is managed by the Library Administrator. The design for this should be one of the outcomes of the introductory workshop. One invariant is the presence of a Master data folder directly under Shared: all standard stencils expect all Master Data list models to be held in this folder. In order to prevent uncontrolled changes to Master Data files, this folder should be protected by making it read-only for all but Master Data Authors. Existing Visio diagrams can be imported directly into BusinessOptix – but the quality of these diagrams can vary widely, not only from one organisation or department to another but from one individual diagram to another. Always import to a staging area (such as Draft Maps) in the Shared folder, and perform an initial review of the imported content. Once the imported models can be matched with the planned Shared folder structure – which may require moving processes from one model to another, or splitting up some and joining together other processes – start moving models into the target areas. 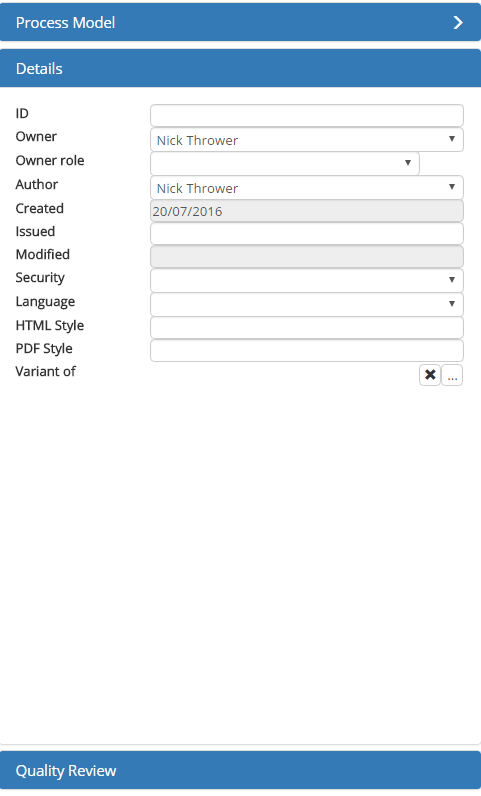 Easy to manage access control, by protecting selected ‘Section’ folders, each with its own Section Owner, so that they may only be read and/or written by the relevant user groups (see USER ADMINISTRATION). Always use the same names for your folders as your stakeholders use for the organisational entities they represent – however long or short those names may be, or however cryptic they may be. The purpose of the hierarchy is to make it easy for your users to find their way around, so use the signposts they are already accustomed to. For process models, use a simple “verb noun” name that describes the purpose of the process – for example, “Handle Complaint”. This makes library navigation easier for users. Avoid nesting too many levels, which makes it difficult for users to navigate the library. In extreme cases, overly nested folders can run into limitations on the length of file paths imposed by Microsoft Windows. If your organisation has many layers, either consider revising it as part of your Business Architecture transformation, or only introduce a sub-folder at those points where access control is required, and otherwise store models for multiple units within the same folder. Use Diagrams to provide a graphical site map, giving users an overview of your organisation, with drill-downs to top-level process and other models. This lets users navigate by whatever means you provide, instead of being constrained by your Shared folder structure. Traditionally, process breakdown structures have reflected the relationships between processes, with sub-processes at any one level placed in a sub-folder of the one containing the higher level process which calls them. This may sound like it would make the navigation between folders consistent with the user journeys promoted via the published HTML. In practice, however, it seldom works unless your processes are highly siloed – often the reason for undertaking a process modelling exercise in the first place. In addition, the approach breaks down wherever a common sub-process is called from multiple higher-level processes, forcing the creation of artificial ‘Common’ folders at one or more points in the hierarchy. Provided you also use diagrams to provide a graphical site map, following your organisational structure actually gives your users more navigation options: they can drill down (and follow breadcrumbs back up) across organisational boundaries, or they can browse the organisation via folders and dive directly into their selected process. Traditional process breakdown structures often use a hierarchical numbering scheme. When your “process repository” is a set of flat files, this may make sense – if you take a file out of the repository, the fact that its filename begins with a series of numbers (like headings in a legal document) means you still know exactly where in the hierarchy it belongs. But BusinessOptix process models have searchable metadata, including numeric codes (whether generated automatically or by hand), so there is no need to include these in the filename as well. Doing so makes it harder for humans to infer the meaning from a model name, which in turn makes it harder to navigate the hierarchy. Users can still find models by these internal codes, using the library’s standard search capabilities – so if they know the code for a model, they can find it directly without needing to browse their way down the folder hierarchy. The recommendations in this section apply to all types of model. The BusinessOptix Library offers a check-in/out mechanism, at the version level, to prevent possible confusion when more than one Author attempts to edit the same model at the same time. It is better to avoid the need to use this feature, by adopting the working practice of having a single Author be responsible for each model during the course of any project. All BusinessOptix models include a common set of metadata, used to make it easier for users to search for models and, in some cases, as information required by workflows. Some of this metadata is maintained automatically by the library, some must be entered by the Author. Use the Verify command (on the Actions ribbon) to check models against rules. 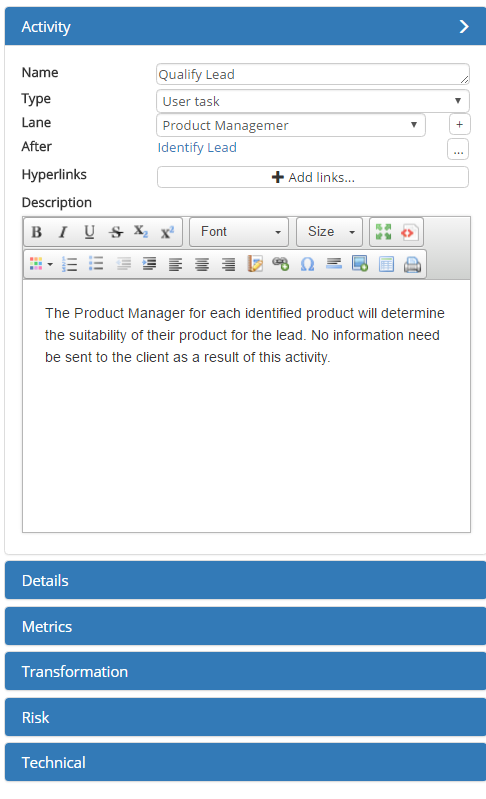 For all models, they include checks for the presence of required metadata properties. For Process models, they also include comprehensive checks against the BPMN standard. Several of these produce Warning rather than Error messages: you can safely ignore these, at least during the initial build phases of the library. Shows accountability (where the buck stops). Activity Shows work to be performed, whether by a human or a system (or a sub-process). 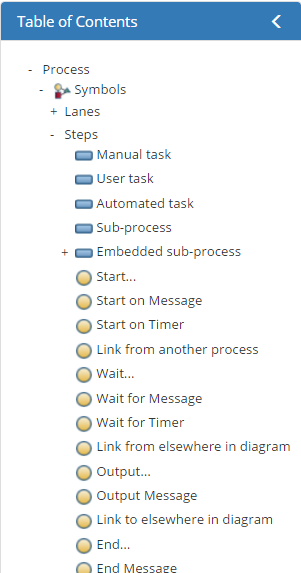 If required, use Receive events to show ‘process breaks’, where the process is forced to wait for an external event (when an external event may interrupt an activity, attach it to the activity as an Interrupt event). Shows where alternate or parallel paths start or end. NOTE that a gateway is NOT a decision: it shows how the process proceeds as a result of a decision. Information Shows information or other deliverables being produced or consumed by the process. Link Shows the sequence of steps in the process. To avoid cluttering the diagram, keep component names short, and put explanatory text in the Description property. For activities, use ‘verb noun’ – e.g. Place Order. The importance of different sets of properties will vary as the library matures. 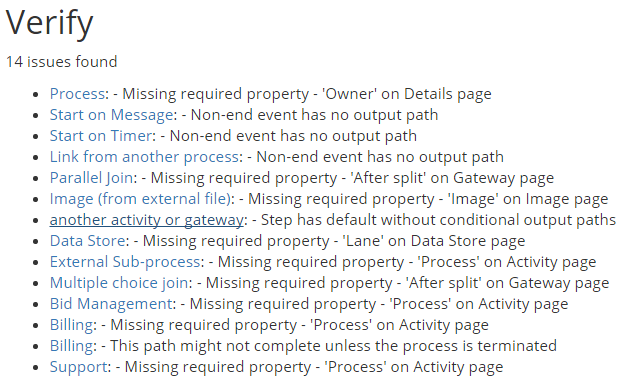 Initially, only the properties on the first page of the Properties Inspector will matter. At some later point, you will probably want to add metrics and other information. See the TAILORING section for a discussion of these capabilities. Do the following activities all start at the same time, and proceed in parallel? Does the process choose just one of the following activities? When a link is conditional – as it usually is from a gateway – always give it a label so that users understand which step will be performed next under different circumstances. A gateway does NOT represent a decision. Decisions are made by a user or a system, and imply at least some degree of effort – and effort should always be modeled as an activity. Instead, use an activity (where the decision is made) followed by a gateway (where the result of the decision determines the route(s) to be taken). As shorthand, you can define the activity where the decision is made as a ‘decision’ activity, and omit the following gateway, instead showing multiple paths out of the decision activity. Make the diagrams difficult to read in PDF output, where they are squeezed in order to fit on a single page. As a rough rule of thumb, more than around 20 components on a page starts to be difficult for users to assimilate. If your process is more complex than this, you should break it into manageable pieces and treat each as a separate sub-process. Note that this is one of the GOOD reasons to keep multiple diagrams in a single model. Master Data models provide a simple way of maintaining a set of hierarchically organized lists, whose contents can be referenced from any other model. Information, products or materials produced and/or consumed by processes. With the standard Process stencil, users can choose Master Data resources for the properties shown above, or enter their own “local” resources if no suitable Master Data item exists. Local resources are stored within the model in which they are used, rather than centrally. Using Master Data rather than local resources allows you to search and report on all uses of any particular resource, across the whole library, so you can quickly understand the impact of changes to that resource. You cannot do this with local resources. And if you begin by using local resources and then decide to move to Master Data, there is no simple way to translate local resources to Master Data, since users may have used even slightly different names for the same resource, and the Library cannot reliably determine that two local resources actually mean the same thing. For these reasons, it is important to build Master Data lists early, and to maintain them. Once created, it is easier for users to select Master Data than to create local resources, and the effort to add the occasional new resource to the Master Data list is easily manageable. You do NOT need to worry about getting the hierarchical structure of Master Data lists right first time: you can move resources from one position in the hierarchy to another at any time: all models that use the modified resource will automatically pick it up from its new location. Output styles determine the look and feel of the documentation generated by the library. The standard BusinessOptix library includes a set of output styles that should meet most immediate requirements. About half of our customers require content (as opposed to purely style) modifications: this can be provided by BusinessOptix or its partners or, if customers have in-house expertise with XML Stylesheets (XSLT), by customers themselves. All standard output styles pick up their logo from the library, so the Library Administrator should upload your logo to the relevant System folder. Check all the standard output styles to see which, if any, cover your needs. A common requirement is for pure style changes (fonts, colors, etc.). If you have an in-house web design resource, these can be modified quite easily via the (for HTML) the standard CSS file or, for PDF, the standard Corporate PDF XSLT file. Diagram Free-form ‘home’ and other high-level navigation pages (e.g. Target Operating Models). 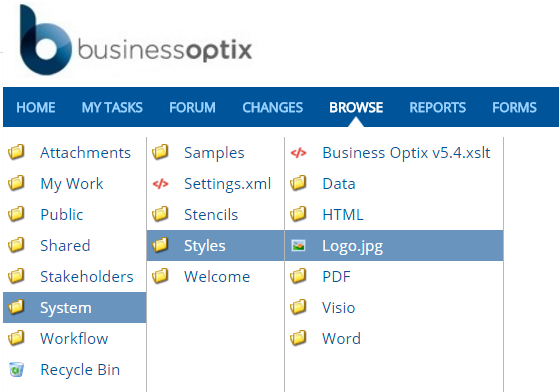 When a user creates a New Model, they are presented with the contents of a predefined template – itself a BusinessOptix model, of the appropriate type, which lives in the System/Stencils folder alongside its stencil. This can be modified (by the Library Administrator) to define Introduction and Conclusion (text) sections and sub-sections for every model of its type, to provide common context to each model. Most customers have some degree of customization made in this way: this can be provided by BusinessOptix or its partners or, if customers have in-house expertise with XML, by customers themselves. Workflow models provide a simple automation mechanism for common Library tasks, such as producing documentation and managing Review and Approval processes. The standard library ships with a single Approval workflow. This can be found in the library's Workflow folder. The standard Approval workflow is provided as a working example. Every organization will have its own different requirements for the Approval process. Anyone with any familiarity with Process models will find it easy to modify and create Workflow models. 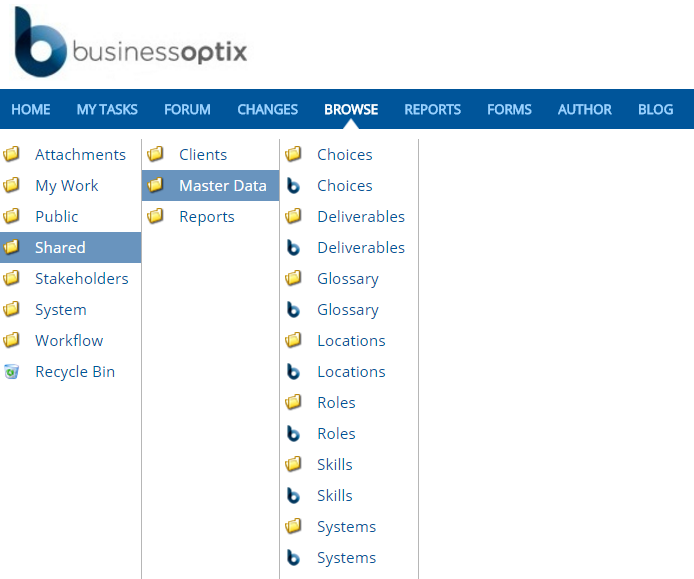 The BusinessOptix library ships with a selection of standard reports, which are extended on a regular basis. 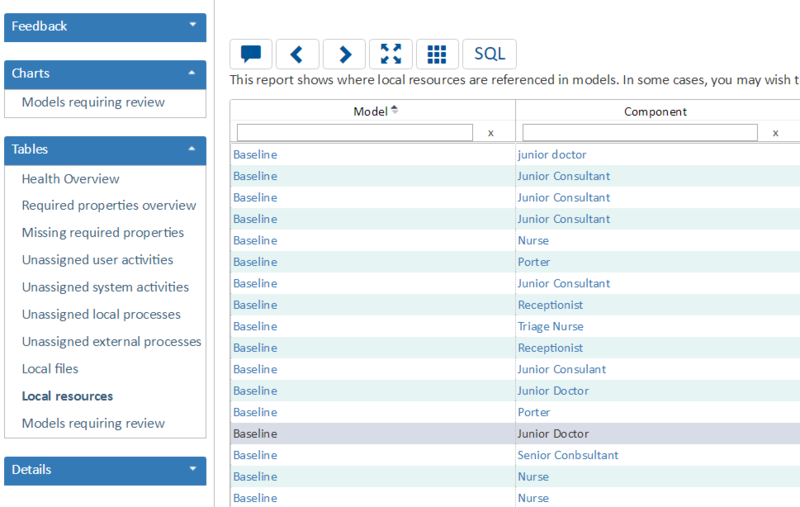 The standard Dashboard report shows a selection of standard reports as a dashboard, with drill-down links to the full versions of each. 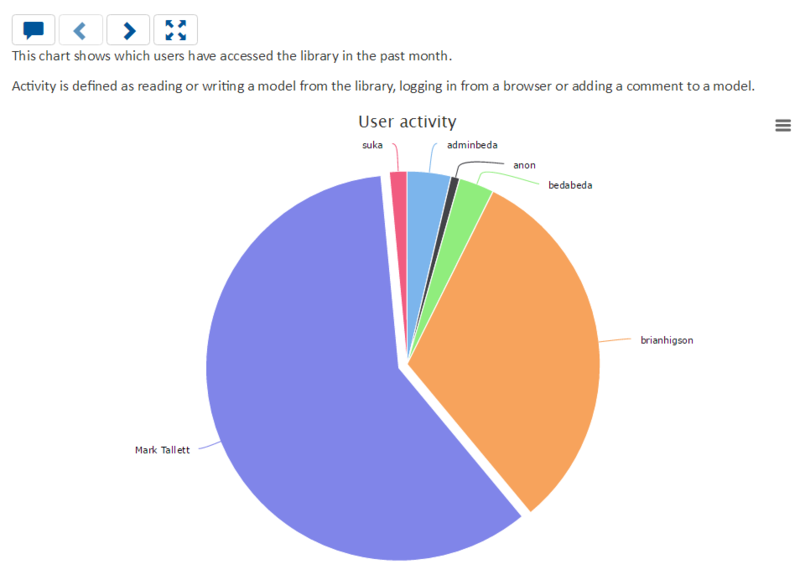 Others display various charts, like the examples in the dashboard.